PUTRAJAYA: The Government is set to take over the operation and enforcement of the controversial Automated Enforcement System (AES). The AES is to be managed by a wholly-owned government company, Acting Transport Minister Datuk Seri Hishammuddin Hussein announced yesterday. He said the takeover proposal followed strong public objections on “who was implementing the system and collecting the fines”. “The people are unhappy that a third party was enforcing the system and collecting fines. “We concluded that it (the objections) was not about the system and I hope this will be a fair decision,” he said. Hishammuddin, who will table the proposal at the Cabinet meeting today. said it would also include amending the Revenue Sharing agreement to ensure transparency, fairness and a just system for all parties. On summonses already issued, he said a legal sub-committee headed by Attorney-General Tan Sri Abdul Gani Patail would discuss and decide whether to write them off or proceed with legal action. “And if we decide to write off, what about those who had paid the fines? “All these will be sorted out soon, including the compensation that the Government may have to pay to the companies involved, which is handled by the Finance Ministry,” he said. The AES is currently under the management of two private firms, ATES Sdn Bhd and Beta Tegap Sdn Bhd. 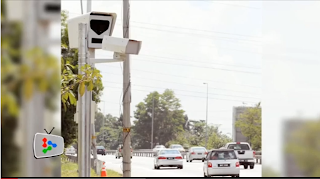 The system captures pictures and video images of vehicles speeding or beating traffic lights in targeted areas and, based on the data collected, the Road Transport Department then issues summonses to the offenders. The system began on Sept 23 last year with 14 cameras installed in Selangor, Kuala Lumpur, Putrajaya and Perak. Another 404 cameras will be installed under a roll-out plan scheduled on Sept 22. Its implementation received strong objection from the public. Early this year, the A-G’s Chambers decided to freeze all court proceedings related to summonses issued under the AES after legal concerns were raised by certain groups.